The glitter that brings smile, the shine that tickles heart and the designs that woo every girl are what the timeless aspects of Hyderabadi Bangles we always tend to boast about. These charm elevating bangles not only excites with their enthralling hues but illuminates glory of the Pearl City through their modest prices and elegance since time immemorial. Despite the name ‘Hyderabad’ sets your alarm on for bangles and pearls, located in the vicinity of Charminar, Chudi Bazar is one particular area that has captivated the attention of millions of bangle lovers with its wide variety of bangles. Decked up with many on-road stalls and shops, the place is an ever busy rainbow that flaunts lots of bangles in various types, models and designs. Some of the most renowned bangles collection of Chudi Bazar includes lacquer bangles, glittering bangles, stone/kundan studded bangles, pearl studded bangles, plastic/metal/thread/brass bangles and many more. 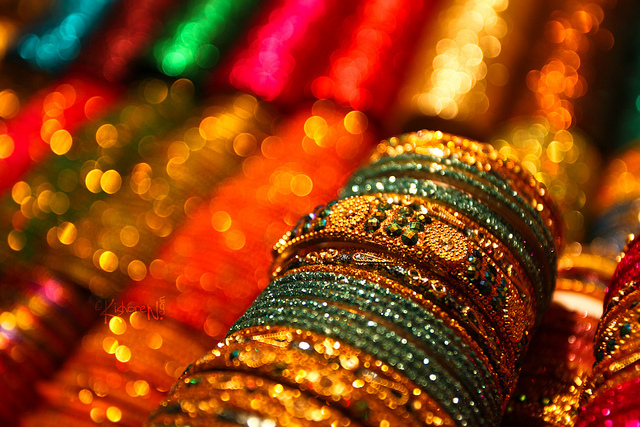 For some people, collection of Hyderabad bangles is a hobby but when it comes to tourists, visiting the place and buying them is a must do in their list if they visit Hyderabad. As the city is a perfect example for weighing various religions and customs, bangles also come in various varieties that meets every tradition and helps in making events more sparkling. No matter whether it is marriage, reception or a day you would like to turn into fashionista, Hyderabad bangles are a perfect choice to bring up the beat of glow as one can get bangles stack in diverse categories like wedding bangles, Indian wedding bangles, fashion bangles, bamboo bangles, Bollywood bangles etc.